Dry freight Steel / Plastic Hinges & Holders. 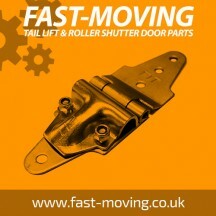 Our dry freight hinges & holders are to suit our steel & nylon roller range. All dry freight hinges & holders that we supply are made of the highest quality materials giving you peace of mind that your dry freight roll up doors are maintained to the highest standards. Fleet Engineer replacement parts are suitable as some replacement components of many door types including :-Dry freight,Coldsaver,JR Industries,Whiting doors,Mobile doors,Henderson doors,Todco doors,Boyriven FIT doors.